Artistically significant charm is a tough musical bogey. 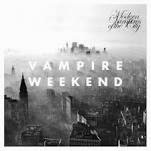 On their third LP, Modern Vampires of the City, New York based indie sensations Vampire Weekend deliver deceptively dense, diverse, yet accessible pop that delights. It's the kind of album that connects with music snobs, English scholars, and teenagers alike; dance music for the contemplative. It's a bold musical vision, fully realized. So keep that list of who to thank in mind. And don't forget the rich ones who were kind. Because no one's gonna spare their time for you. Take your wager back and leave before you lose. The morning of "Bicycle" quickly becomes night, and the dance party begins. If Jim James nailed his own version of Graceland, with a twist of Yankee Hotel Foxtrot, this would be the near result. Koenig has a background in African music, and it permeates much of the record, especially the superb "Everlasting Arms." His vocal chops match his lyrical prowess. Like James, he knows how to measure his vocal effort, alternately rocking you to sleep or bringing down the house, as the context requires. As one would expect from Ivy League musicians, inspirations are diverse. "Arms" opens with orchestration before launching us to the African savannah. The album even brings Irish hyper folk into the mix (the Riverdance ready "Worship You"). "Don't Lie" lays gospel organ over a marching band drum roll. Count the seconds, watching hours. Once a trance is obtained, the listener is ripped momentarily out of it with percussive shots of out-of-nowhere piano and renewed electronic noise. Then, a peaceful drumroll leads immediately back to ... serenity. The song is a model of lyrical quality and restrained texture, delivered in a taught sub 4 minute package. "Hunt" is emblematic of the album's quirky, taut genius. As a body of work, Modern Vampires is a bold experiment in intelligent pop, beautifully executed both musically and lyrically. I can't get enough of it. Casual fun should always be this serious; deep art this charming.